Australian star Shane Warne believes fellow spinner Muttiah Muralitharan will beat him to the Test record and could even claim 1,000 wickets. West Indies fast bowler Courtney Walsh currently holds the record with 519, with Warne on 517 and Murali on 513. But Sri Lanka's Murali is set to overtake the record when his side play Zimbabwe later this month. 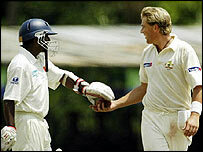 Warne said: "I think Murali is going to get to 1,000. That's not behind the realms of possibility at all." Warne, who is back as captain of Hampshire, believes he himself could notch up 600 Test scalps before retiring. The 34-year-old told BBC Sport: "I would like to think another 80-odd Test wickets are within my reach. "Not that it will matter much because of Murali. "He's only 30 and he bowls half of Sri Lanka's overs, so he'll have plenty of time." Warne would not get involved in commenting on the legality of Murali's "doosra" action, after he was reported by umpire Chris Broad while playing against Australia. He said: "He's got an unique action. If somebody is unorthodox or different you should go with it. "You don't want to change somebody's style unless they're doing something wrong."